Interesting read in this weekend's Times Pic. Alas, a two party system in the state legislature. After 150 years of the good ole boy network, it finally appears the two parties in the state legislature have matured to a point where they may actually stand for something. The Democratic National Party, led by Howard Dean, must be very excited to see that despite a conservative movement within the Louisiana electorate, Democrats in the state legislature are sticking to the core beliefs of their party. Add 1,200 more government employees at a cost of $63 million dollars. Rebuild Louisiana’s failed and inefficient Charity Hospital System to pre-Katrina abyss. Spend every penny of the surplus (one time money) on expenses that will have to be paid every year…despite the fact that the economy is slowing down. Give ALL government employees a raise, because ALL government employees deserve a raise. And by all means, do not reform, refine, or restructure any government agency or program. Always remember big government works best. 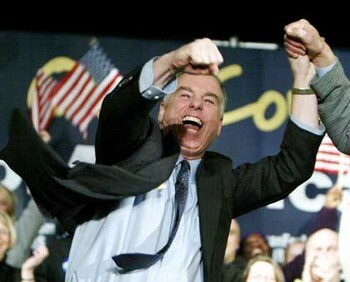 Howard Dean must be proud.